India of the 19th century produced several remarkable thinkers like Raja Ram Mohan Roy, Keshub Chandra Sen, Dr. Debendranath Tagore, Ishwar Chandra Vidyasagar, Swami Vivekananda and Swami Dayananda Sarasvati. In many senses Swami Dayananda Sarasvati was highly individualistic, original and unique as a man; while all the other thinkers of his time had an effective knowledge of English, Swami Dayananda had no knowledge of the English language. When he met Keshub Chandra Sen, President of Brahmo Samaj in the 1870s in Calcutta now Kolkata, Keshub Chandra Sen expressed his regret that Swami Dayananda did not know English. He also added that Swami Dayananda could have become his companion on his next visit to Britain if only he could speak and write in English fluently. Swami Dayananda Sarasvati immediately retorted to him: 'Don't you think it is a greater pity that the leader of the Brahmo Samaj knows no Sanskrit and speaks in a language that most Indians cannot understand?' Thus we can see that he was a striking symbol of Indian nationalism long before the establishment of the Indian National Congress in 1885. Even the Indian National Congress started talking about the Indian languages only after the Nagpur session of the Congress in 1920. A great social and religious reformer, he founded the 'Arya Samaj' in 1875. 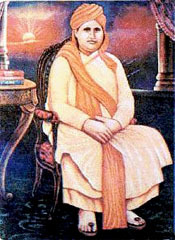 Swami Dayananda Sarasvati's life and mission constitute a glorious chapter in the national movement for the reformation of Hinduism in the second half of the 19th century. Swami Dayananda was born in a Brahmin family in 1824 at Tankara in Gujarat. He came from a well-to-do family and his father instructed him in Sanskrit and Shaivism from the age of five. Historically it is important to note that Dayananda revolted against Idol worship even at the age of 14. In order to avoid being married, he ran away from home at the age of 19, in 1843, to become a wandering monk of the Sarasvati Order. He spent the next 16 years as a roaming monk, living in jungles, in Himalayan retreats and at several places of sacred pilgrimage in different parts of northern India. In this phase of his life, he went in search of spiritual salvation through yoga. From 1860 to 1867 he served as a disciple of Swami Virajananda. This was a turning point in his career as it turned him from a private spiritual aspirant into a public religious crusader. The fourth phase in his life was represented by the period from 1867 to 1872. This period marked the beginning of Swami Dayananda's first efforts in the direction of reforming Hinduism. This period also saw the formative period in the genesis and growth of his new ideology. The climactic event during this phase was provided by the famous debate over the Vedic sanction of idolatry at Benaras. Like Adi Sankara in the 8th century AD, Swami Dayananda Sarasvati challenged several scholars living in Benaras, inviting them for a critical debate on the Vedas and other Hindu scriptures. The fifth phase of his life from 1872 to 1875 is considered as extremely important in Indian history. During this period, Swami Dayananda came into personal contact with the Hindu elite of Calcutta. Though it had no impact on the content of his teaching, yet it had a considerable influence on him that made him change his style. He readily accepted the two pieces of concrete advice of Brahmo Samaj leader Keshub Chandra Sen, namely, that the Swami should cover his body fully rather than appear in a loin cloth, and that he should publicly lecture in Hindi rather than in Sanskrit. He soon began preaching his vision of reinstating a purified Vedic religion, owing its allegiance only to the spiritual authority of the Vedas. He debated with orthodox Hindu scholars and Christian missionaries in Calcutta and elsewhere. It was during his stay in Calcutta that Swami Dayananda discovered the importance of public lectures and publications. Swami Dayananda established the 'Arya Samaj' in Mumbai in 1875 to promote social service. He firmly believed that India's downfall had started the day women were deprived of education, and were put behind the veil (pardah). When the Arya Samaj was founded by Swami Dayananda to propagate his ideas and ideals, the foremost of them was represented by the motto: 'Go back to the Vedas'. In this respect he differed from both Swami Ramakrishna Paramahamsa and Swami Vivekananda. For example, Swami Ramakrishna Paramahamsa stated that the truth is not in the Vedas and that one should act according to the 'Tantras'. The attitude of Swami Dayananda Sarasvati was more dogmatic in that he accepted the doctrine of the infallibility of the Vedic authority in Hindu philosophical speculation. 'I hold the four Vedas (the divine revealed knowledge and religious truth comprising the Samhita or Mantras) as infallible and as authority by their very nature'. a) There are three things beginningless: namely, God, Souls and Prakriti or the material cause of the universe. b) Moksha or salvation is the emancipation of the soul from all woes and suffering. And resumption of earthly life after the expiration of a fixed period of enjoying salvation. The final phase of Swami Dayananda's life was from 1876 to 1883. This period saw the widespread growth of the 'Arya Samaj' in different parts of undivided Punjab. The Lion of the Punjab, Lala Lajpat Roy was strongly influenced by the ideology of Arya Samaj and became one of its ardent workers. All are aware of the fact that Swami Vivekananda attended the Parliament of World Religions at Chicago in 1893. What is not as well known is that Swami Dayananda went so far as to convene a conference of the representatives of all religions on the occasion of the Delhi Durbar organized by Lord Lytton, the Viceroy of India in New Delhi on 1 January, 1877. Dayananda Sarasvati exhorted his countrymen to always bear in mind the egalitarian approach of the Vedas. He said that the smrutis and puranas misled people into such practices as untouchability, and exploitation of women. He was primarily responsible for reviving the ancient Indian educational system of gurukula, where students from different strata of the society studied together under one guru without class or caste discrimination. Arya Samaj and the gurukul system of education started growing in Punjab, and other northern provinces. Swami Dayananda opposed child marriage and the ban on remarriage by widows, and he opened Vedic study to all castes. Swami Dayananda's revolutionary and radical thinking had resulted in the emergence of several enemies from all spheres of life. On the Deepavali day in 1883, he was a guest of the Maharaja of Jodhpur. The king who was leading a dissipated life in the grip of carnal pleasures, was advised by Swami Dayananda to lead a righteous life marked by purity, inner and outer discipline and a sense of mission. This upset the calculation of many members of the staff in that Royal Court. Some of them plotted to kill Swami Dayananda and on the night of 30 October, 1883, he was poisoned during the festival meal. Dayananda Sarasvati passed away on that night. Like Socrates, Swami Dayananda Sarasvati too was poisoned by people who could not stomach the cardinal truths he uttered without fear or favor. To lead a fruitful worldly life, working for a noble cause was important, and he preached that salvation was possible through social service. Dayananda was a great patriot. He gave a clarion call to all the Indians to shed off their cowardice and hesitation. He felt that an armed revolution was a worthy means to fight tyranny and to liberate India from the British yoke. As a teacher, he was instrumental in shaping the mind and heart of Shyamji Krishna Verma, who later patronized many Indian revolutionaries like Madanlal Dhingra and Veer Sawarkar in London. Any study of objective Indian history will clearly show the important role played by Arya Samaj in the making of modern India. Sir, you have mentioned that Maharshi Dayanand Saraswati Maharaj was poisoned on 30th Oct 1883. Actually this unfortunate event happened on 29th Sept 1883. Our brave hero remained on bed inspiring us & fighting with death for almost 30 days. Please see other documentary evidences and correct the Article to this extent. Swami dayanand saraswati ji was one of the top most minded person.We all should be very thankful to that type of person ,which gave us the right path for living in the materilism world.Thankyou for the right path or we can say that to guide us on the way of veda's..
sir, you have give a good description about swami ji. but do you think in present time is it possiable to reunited hindus on the way of arya samaj. hindus who is already divieded on the basis of diffrent god, cast,and statewise. you don,t think even the present political scenario & political leaders is responsiable for "DURGATI" of hindus.